We went to the newly opened Ikea here in Qatar. As expected, the store offers an enormous array of furnitures for the home. The area is huge like those found in Singapore. The experience was interesting as the store offered genius interior designs and concept on how to decorate and even organize parts of the house. And i like their minimalist designs. My husband and I need to apply that in our place. 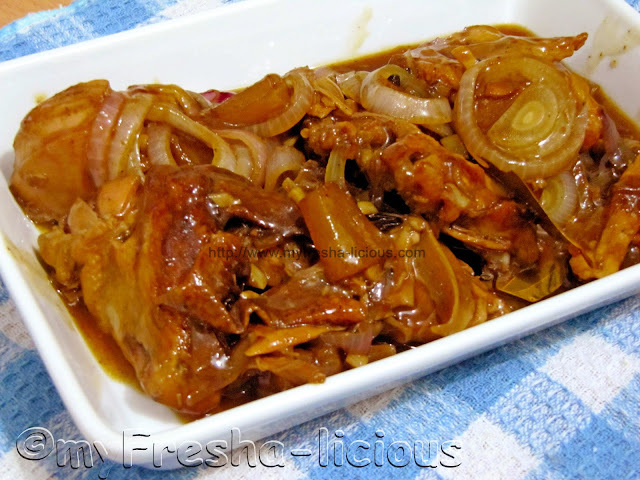 Anyway, yesterday, we have posted the Cebu lechong manok which I cooked last week (see my recipe here) But since my husband was not into it, we only finished one-half of the roasted chicken. So what's the best thing you can do with your left-over (my husband calls it TIRA-yaki) lechong manok (roasted chicken)? Transform it into a delicious lechong paksiw dish. Our Paksiw na Lechong Manok sa Mang Tomas has been ranking number 1 in our most read posts so I decided to make another lechong paksiw recipe. It was timely indeed specially that we have half of the cebu lechong manok I have cooked the other day lying inside the refrigerator. Lechon is the Filipino term for roasted meat dishes and which may refer to pork, chicken, duck, etc. that was cooked in this way (make sense does it?). Paksiw is a Filipino term used to call stews made of vinegar. So Paksiw na lechon literally translates to roasted chicken/pork/ or any meat slowly in a mixture of vinegar and spices. Commonly, paksiw na lechon like our Paksiw na Lechong Manok sa Mang Tomas, requires the addition of sarsa (lechon sauce) or liver sauce or mashed liver. However, we do not have any of those on hand so I decided to add sweet pineapple syrup and pineapple slices, instead. 1. Throw in all ingredients in a pot (except for the cornstarch) and cook them until the chicken meat starts to pull apart. 2. Pour the cornstarch mixture. Stir and simmer until the sauce thickens. Serve with boiled pechay and steamed rice. Hi! Great recipe you got here. Would you mind if we post (re-post) this recipe of yours to our food blog: filipinofoodsrecipes.com ? It will be a featured post wherein we will give your blog, name, and social media links full credits for the whole recipe along with the photo. Thanks so much! Will let you know/inform you guys when the post goes live :). I will craft the post today. Salamat! Hi guys! It's done! here is the recipe post: http://www.filipinofoodsrecipes.com/2013/04/paksiw-na-lechong-manok-sa-pinya.html . If you can directly link to that article by using a badge (like the one I've used at the end of your featured recipe), it's much better. You can place the badge or image under or before the PETITCHEF badge or logo at your sidebar. I will post your recipe to our social media accounts and hopefully it can bring new visits, traffic and followers for your blog/recipes. Thanks so much again guys and more power to our blog(s). PS: What's your email address? Hi Ron. We saw it. Thanks! I sent you a PM.